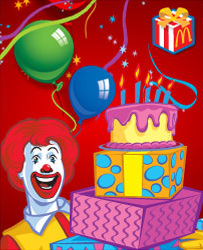 Celebrate your child’s birthday at Macca's®. Our parties are fun, hassle-free, and make for great memories. Choose from two great-value packages, each offering loot bags, balloons and entertainment. Please contact your local restaurant to find out if they host Birthday Parties.